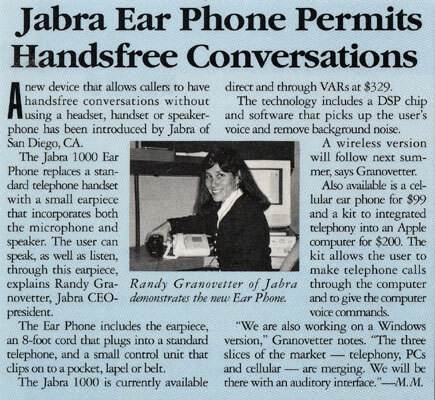 A new device that allows callers to have handsfree conversations without using a headset, handset or speakerphone has been introduced by Jabra of San Deigo, CA. The Jabra 1000 Ear Phone replaces a standard telephone handset with a small earpiece that incorporates both the microphone and speaker. The user can speak, as well as listen, through this earpiece, explains Randy Granovetter, Jabra CEO-president. The Ear Phone includes the earpiece, an 8-foot cord that plugs into a standard telephone, and a small control unit that clips onto a pocket, lapel or belt. The Jabra 1000 is currently available direct and through VARs at $329. The technology includes a DSP chip and software that picks up the user's voice and removes background noise. A wireless version will follow next summer, says Granovetter. Also available is a cellular ear phone for $99 and a kit to integrated telephony into an Apple computer for $200. The kit allows the user to make telephone calls through the computer and to give the computer voice commands. "We are also working on a Windows version," Granovetter notes. 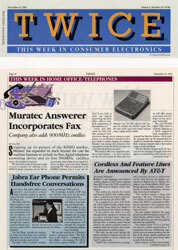 "The threee slices of the market - telephony, PCs and cellular - are merging. We will be there with an auditory interface." -- M.M.